The return of the Tablet craziness echoed with the perusal of "A bitter pill to swallow: the rise and fall of the tablet computer yesterday during my flight. The article analyzes Tablet PCs as a "product failure". Given that it was written in 2008, it states that it "no longer represented the future of mobile computing", which is funny as people got to back it recently after rumors of an Apple "bigger ipod touch / e-book reader". Yet another "recurring holy grail" as I discussed last year in my introduction to the Lift 2009 conference. "So why has the tablet computer not been a successful product? In theory, it had it all (...) Yet many of the factors mentioned in the case study as to why certain individual tablet computers had failed are issues which subsequently have been resolved. Clearly, the technical problems which plagued early products such as slow processor speeds and software reliability have been overcome. 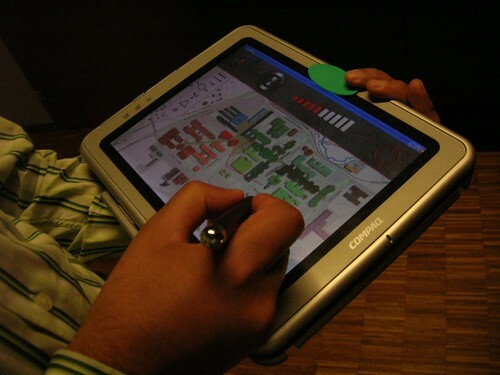 The compatibility of software means that applications for such computers are far greater in number and, while still not perfect, issues of functionality such as the reliability and accuracy of handwriting recognition software have been greatly improved. The manufacturers currently involved are not start-up enterprises lacking in financial support or backing; and the products are now part of large ranges of computing equipment from well-known and respected companies, and have received marketing support of a suitably high level. (...) it would appear from the technical factors that have been resolved that the only possible barriers left to the acceptance of tablet computers are social ones. The concept of “interpretive flexibility” proposes that different groups of people have different views on the extent to which a particular technology “works” for them. However “natural” a form of communication writing may appear to be, perhaps, as Jeff Hawkins believes, people don’t want to write on computer screens, and a pen on a large display is not a good user interface for a computer. The feel of pen on paper is a difficult one to surpass. (...) Another factor could involve the complexity of a personal computer, which is clearly accepted if not desired in a desktop PC. This may not be acceptable in such a portable format as the tablet PC. Slow start-up times, large size and weight, and the compromises inevitable in multifunctional products such as a full computer do not cross over well to situations in which the computer is held and carried around by the user, and constantly turned on and off. (...) It is possible that the semantic associations of tablet computers and the body language employed when using them is an issue. " Why do I blog this? Because I believe that understanding the reasons of product failure is always fruitful and relevant as a starting point in a design process. Although I am not entirely sure about the reasons explained in the article, it's interesting to see that some of the pain points have been fixed and that the return of Tablets can be explained by different factors: confidence renewed by rumors that an industrial actor such as Apple would go into the field (which may or may also lead to the return of big fishes such as Microsoft and HP), the merging of the e-book and tablet PC metaphor (while 5 years ago the two were a bit distinct), etc.